This month we’ve been reading books that we got given for the boys’ birthdays. This photo of their birthday cakes shows the theme that we went for, and we got books along the same vein. 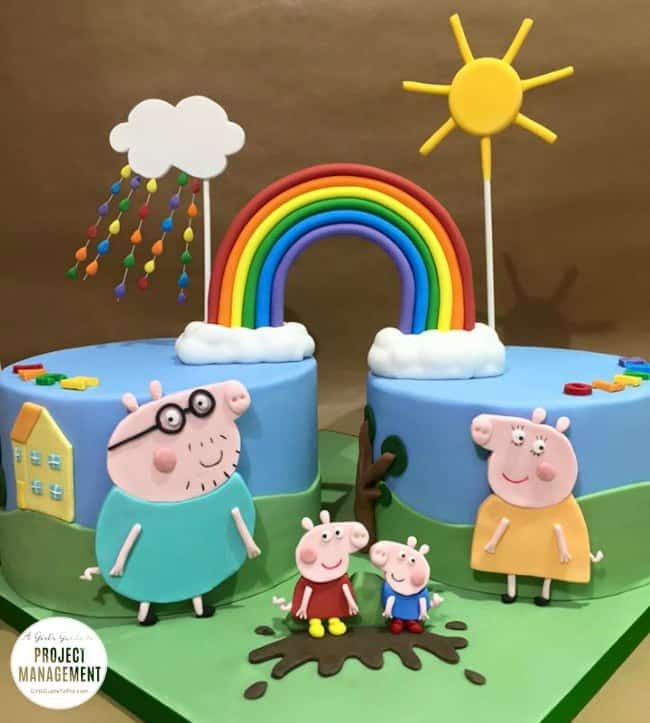 I don’t know why people don’t like Peppa Pig. OK, I do. Daddy Pig is often portrayed as a bit rubbish at doing normal things, but then, he can’t be good at everything. He has won trophies for his sports endeavours, after all. If you’ve been following my reading choices for a while you’ll know that I’m trying to avoid books that make me cry. Well, I almost didn’t do that this month as I got A Girl Called Jack out of the library. It’s a cookery book, for goodness sake! But her description of food poverty and what it’s like to look at your hungry toddler and have nothing to give him had me welling up. The recipes were pretty good, too. Macaroni Peas is now a staple on our meal planner. I downloaded Insurgent and Allegiant, the second and final parts of the Divergent trilogy from Netgalley. I’ve been trying to read them for ages but the library only ever had the final part, and you have to read them in order. Insurgent was good: gripping, believable, everything that YA fiction should be. Allegiant was good in that I had already bought into the story for about 1200 pages so I needed to finish it. While it was well-plotted it seemed as if every other page had a new plan for an uprising or a new group being formed to take down the old groups. Rebellions everywhere. The series never shied away from the difficult parts of the story and the ending was what it needed to be. Thank heavens for the epilogue, though. I wouldn’t have been satisfied if the story had ended at the end. I don’t know if I will watch the films. As that would involve actually finding the films and about 5 hours where the boys are both sleeping for me to watch them, it seems highly unlikely. Right now if they are asleep, I am asleep, even if my colleagues do laugh at me for going to bed at 9pm. I still haven’t opened The Social Project Manager and to be honest I totally forgot I had it. I finished Message Not Received by Phil Simon, at long last. It’s been on my desk since the summer and I wasn’t putting off reading it, I just prioritised other things. It is a good, detailed investigation into workplace communications and what you should be doing differently to get your message across. I found it valuable. I also finished The Confidence Effect and you can read my review of that here. You know reading counts towards your PMP PDUs, don’t you? So what did you read this month?